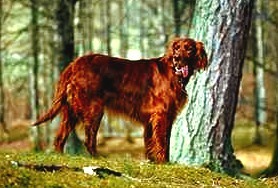 I am sometimes called the Red Setter and my breed was developed by crossing Irish Water Spaniels, Spanish Pointers, and English and Gordon Setters. I was a very popular gundog in Victorian England because of my energy and my ability to run fast. My coat is longish and does require daily brushing to keep it looking its best, even though elaborate grooming is not necessary unless I am going to have my picture made or something. I need lots of room to run and play because I have what seems like unlimited energy. For that reason, I would not like to live in an apartment unless you will take me jogging with you every day. I am really extremely good-natured and easy going. I will be more than happy to let you know when someone is at the door, or to alert you when the squirrels are robbing the bird feeder, but I enjoy people and attention too much to play the role of vicious watchdog. I am, on the other hand, a great pet or hunting companion. When fully grown, I am between 25 and 27 inches tall (63.5 to 68.6 centimeters) and I weigh between 60 and 70 pounds (27 to 31.5 kilograms). We have no Irish Setter Breeders listed at this time. Click here to place your Irish Setter Ad!